"It's one of the best combinations - Chinese lettuce & pork!! Whenever I get hold of a beautiful Chinese lettuce, despite the work involved, I cannot help cooking this..."
With regard to heat, the output of a professional cooker is approximately 20,000 Kcal/hr, a domestic one is only 5,000 Kcal/hr. The difference this causes is quite obvious. Regarding spices, you can manage to obtain Chinese spices now. It may be point 3; "initial preparation" which really makes the taste difference between dishes cooked by the professionals and amateurs. 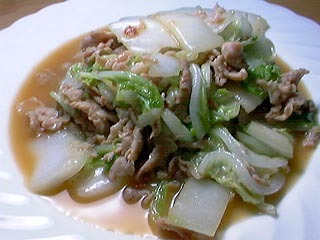 The initial preparation method was introduced in the recipe for Hoy-Cou-Lou, the essential point is Aburatoshi. Heat the oil to a mid-high temperature, then fry the vegetables briefly and take them out. Then, put them back into a pan of new oil which is heated to a very high temperature. The preliminary "frying" procedure is the Aburatoshi, and it makes the vegetable very crisp while they are thoroughly cooked and packed with flavour. Without this preliminary procedure, if you fry vegetables, they will remain either uncooked and raw or overcooked and too soft. By understanding the necessity for this basic procedure, I dare say, you have mastered most of the technique involved in stir fry. NB: My friend's father gave us a most impressive Chinese lettuce (6th November 97). Apart from hot pots repertoire, I believe this is the one and only Chinese lettuce recipe to satisfy the kid's enormous appetite. Cut the pork into 1cm wide shreds and mix well with ginger juice, soy sauce, sesame oil and salt in a bowl. Then add potato starch and mix them well further. The Chinese lettuce in the photo was a present (please see NB above). Very firm and the leaves are concentrated. An impressive one ... I tried a piece of the white as it is i.e. raw, and by god, it was so sweet! It really was a good Chinese lettuce. Anyway, cut the Chinese lettuce as per the photo (2cm wide). If the leaves are too thick, you can break them by bending. The volume of the lettuce may seem too much, but it actually is just enough for the volume of pork. Do not be scared and reduce the volume, or you will have to cry out for further supplies of lettuce later at table. To avoid the disappointment, ignore your present fear and be bold to use the volume of lettuce as indicated here. Pour the sesame oil in a large wok. At the temperature of 120-140 *C (250-285 *F), add pork. (The heat of the hob should be low to middle.) Fry the pork for 1-2 minutes, and using the strainer, drain the oil. Pour sesame oil into the same wok again, and heat it till smoke comes out. Throw away the oil and pour new oil again (2-3 table spoon). Add the pork (the above Aburatoshi and preliminary wok heat-up techniques help pork not to stick to the pan). When the lettuce becomes a little more tender, add the seasoning sauce (pre-mixed as above), stir the whole contents of the wok. Be careful not to overcook the lettuce and take the wok off the cooker before it becomes too tender. By then, the volume of lettuce will have reduced considerably, and I hope you are heaving a sigh of relief and muttering "Thank goodness, I listened to him..." looking at the final product of your effort.